Last night we had April showers, and today is a drippy day. 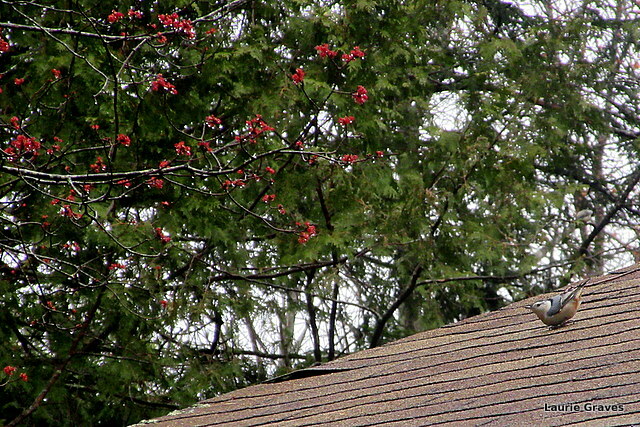 While I was out taking pictures, I heard a nuthatch’s call, and I spotted the little creature on the roof. As I was walking around the yard, I thought of silly little snippet my daughters liked when they where young. And what do Mayflowers bring? Ah, Pilgrims, those stern settlers of New England. To be fair, they had their good points. With their emphasis on individual choice merged with community, Pilgrims (aka Puritans) were the motivators for yearly town meetings, which to this day is the democratic and sometime contentious governing force in many small towns in Maine. With their desire to create a “Godly society through educated citizens,” Puritans established the school laws of 1642, which encouraged literacy and universal education. In 1636, Harvard was founded, and in 1711, one of the first public libraries opened in Boston. It cannot be denied that the Puritans were a bloody bunch in their early days, but no bloodier than any other group. Those were bloody times, both here and in England and Europe. But now I must be blunt, and I apologize to readers who come from Puritan stock. The worst thing about the Puritans was that they were party poopers extraordinaire. In fact, they waged a war against Christmas, and found the holiday to be a pagan “abomination” totally unsupported by Scripture. The Puritans referred to Christmas as “Foolstide,” and for a time it was illegal to celebrate Christmas in New England. After wandering around the wet yard and taking pictures and thinking about Pilgrims, I decided it was time to come in for breakfast and for my morning’s work on the computer. 😀 Love that last line! Glad you are celebrating Earth Week on your blog. Interesting history lesson today, and you are right that people’s behaviours have to be viewed historically from within the cultural context of the time. Take care. Ah, now I understand why there were few parties or celebrations in our house when I was growing up! I must prepare for the May Day frolicking. 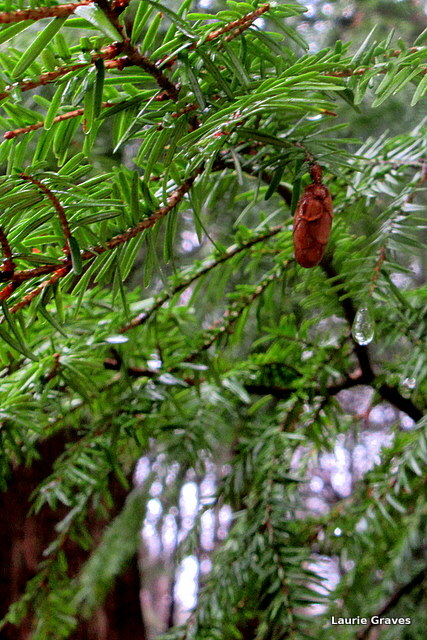 I love the picture of the pine cone and drop of water. This post is both fun and informative. Puritans always struck me as a humorless bunch. My view of them was influenced by reading “The Witch of Blackbird Pond” when I was young. Did you ever read it? It was one of my favorites. Although the Puritans were known for being hard workers, they were not known for their sense of humor 😉 I have heard of the “The Witch of Blackbird Pond” but I have never read it. I still enjoy YA and Middle Reader books, and I will put it on my teetering TBR pile.